Blurb Description: Cinderella goes to the con in this fandom-fueled twist on the classic fairy tale. Before I start, I should say that I’m a little wary going into fandom novels. I have this irrational fear that the protagonist is only a fangirl or a fanboy as a quirky side story and that it’s not at all given enough importance. 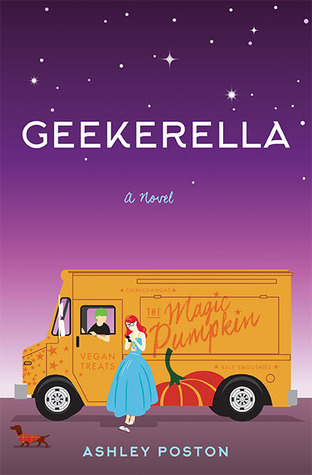 And yet, after about ten minutes of reading Geekerella, I knew I was didn't need to be wary of ANYTHING. Danielle – Elle – lives with her horrible stepmother (*ahem stepmonster*) and her two equally horrible stepsisters. Her mom died at a young age, and her father in an accident a while later. In a home that used to be hers and her father’s, she feel like an outsider. She’s made to do the chores and the cleaning and she also has a job – she’s a modern day Cinderella, only without a Prince Charming. Until she gets a call from a strange number, for what used to be her dad’s number for the Convention he used to organise, and a conversation sparks with a boy she’s never met and knows nothing about. A boy she’s also spewing hate about on the Internet for his new role in her favourite show’s reboot. And her geeky fairy tale is just about to begin. I LOVED ALL THE GEEKY AND ADORABLE THINGS ABOUT THIS BOOK. Told from the dual perspectives of Elle (Cinderella) and Darien (Prince Charming), Geekerella is EVERYTHING a fairy tale retelling with a fangirl twist should be. 2) Darien is Elle’s Fictional Crush in a reboot of her favourite TV Show, and he is SO perfect and insecure and I LOVE HIM ACK. 3) DID I MENTION THAT DARIEN IS A FANBOY? He was a Prince Charming FANBOY. SAVE ME. 5) It’s such a Cinderella retelling with the BEST KIND OF TWIST. The only reason this isn’t a five star read for me is because in the end of the book, Elle and Darien were MAGICALLY IN LOVE WITH EACH OTHER. I understand having feelings/ being deep on the crush end but I DIDN’T GET HOW THEY THOUGHT THEY WERE IN LOVE WITH EACH OTHER. A hilarious, adorable tribute to fairy tales and fandoms that you NEED TO GET YOUR HANDS ON! ASHLEY POSTON loves coffee, moving castles, and starry night skies. A graduate from the University of South Carolina, she earned a degree in English and became a scholar in procrastination. When not in search of her next great adventure, she lives with her bossy cat in rural South Carolina. They are both firm believers that cosmic princesses can be space pirates, too. Sometimes, you can catch her lurking around in coffee shops where she reads copious amounts of fanfiction and plays a lot of video games. Oh, and she writes nerdy books for young adults. For rights inquiries, please contact Holly Root of the Waxman Leavell Literary Agency. What are some of your favourite fandom inspired books? Have you read any of Ashley Poston's previous books? What did you think of them?